Air Lingus pilots have suspended their planned strike after reaching an agreement with management. 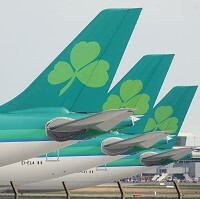 Following discussions at the Labour Relations Commission (LRC) that lasted 15 hours, the Irish Airline Pilots' Association (Ialpa) said the proposed industrial action has been put off until July 1. The move will come as a relief to tens of thousands of passengers who faced widespread flight chaos and potential travel insurance claims as the strike threatened services at Dublin, Shannon and Cork airports. Thousands of air passengers rescheduled or cancelled their bookings amid the uncertainty, the airline said. Ialpa, which is part of the Impact trade union, said the airline's shortage of staff and a chaotic roster meant that pilots were regularly working six out of seven days throughout the peak season last summer. It said the latest round of negotiations addressed the two key areas of concern for pilots - the management of the peak summer period roster and the development of a longer-term form of roster. "Agreement has now been reached on both of these issues," an Ialpa statement said. "The industrial action has been suspended until July 1, in order to allow time to implement agreed proposals on the summer rosters." Pilots at Belfast and Gatwick have also balloted for industrial action and will serve notice on the company. Ialpa said those issues are the subject of further discussions.